I'm back, new Blogger, etc. I have returned from my unplanned blog hiatus. Before and directly after Christmas Day I was so busy that I couldn't take time to blog. (I also didn't get enough sleep and didn't take my vitamins.) The result of all of that is that I ended up with a nasty cold and bronchitis. I felt so rotten I could hardly focus to read, let alone write. Although I am feeling quite a bit better, I want to be sure that I am no longer contagious before I go near many people, so I am home from church this morning. This isn't going to be the most exciting new Year's Eve! We also missed out on a gathering of friends in Ohio yesterday. That was a disappointment to all of us. I switched to the new Blogger this morning. I waited as long as I could, but the time had come. I will enjoy using the labels for the posts. Yes, this penguin game is a total waste of time. But it is hilarious. There were the usual moments of levity that are to be expected when the cast is composed of a bunch of goofy kids. But there was also the sweetness and the story that never changes. When a friend named her blog Favorite Apron, a very clear picture came to mind. It was a yellow/gold ruffled apron. It was voluminous. It had sleeves that covered the sleeves of a good dress. It was an apron that allowed someone to engage in serious cooking without endangering clothes. This apron lived in the apron drawer in my Grandma Caston's kitchen. It was a wide drawer full of aprons of all shapes and sizes. I loved to help my grandma in the kitchen. And I almost always wore an apron. I wish that I had a couple of grandma's aprons. Partly because I am sentimental and I would love to have that little bit of her in my kitchen and partly because I could use a couple of good aprons. I am a messy cook. I wear an apron most of the time when I cook. It's a denim bib apron that I earned as a sales incentive from a book company. It is very servicable and does a pretty great job of protecting my clothes. But it isn't feminine. So I'm on a mission to find some sweet old aprons. They won't be my grandma's, but I'll still enjoy wearing them. I always enjoy choosing my pictures for the Saturday Photo Hunt, but we have our first Christmas get together with the extended family today in Anderson, so we are in a frenzy of preparation this morning. Tomorrow is the kids program at church and the sing-along Messiah being hosted by the Bach Collegium. I hope that the predicted 60 degree weather doesn't cut into the Messiah crowd, but I think it probably will. I will leave you with a picture or two. 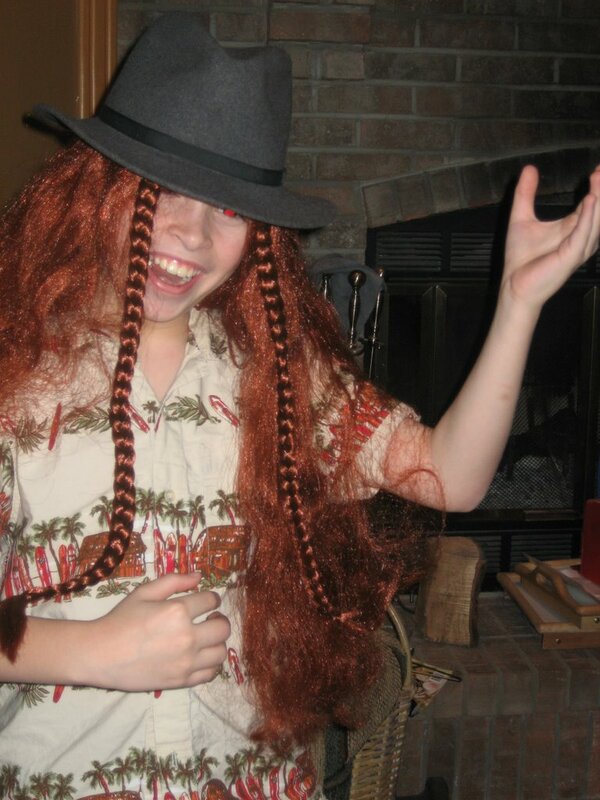 The first is Andrew playing air guitar in a long wig. 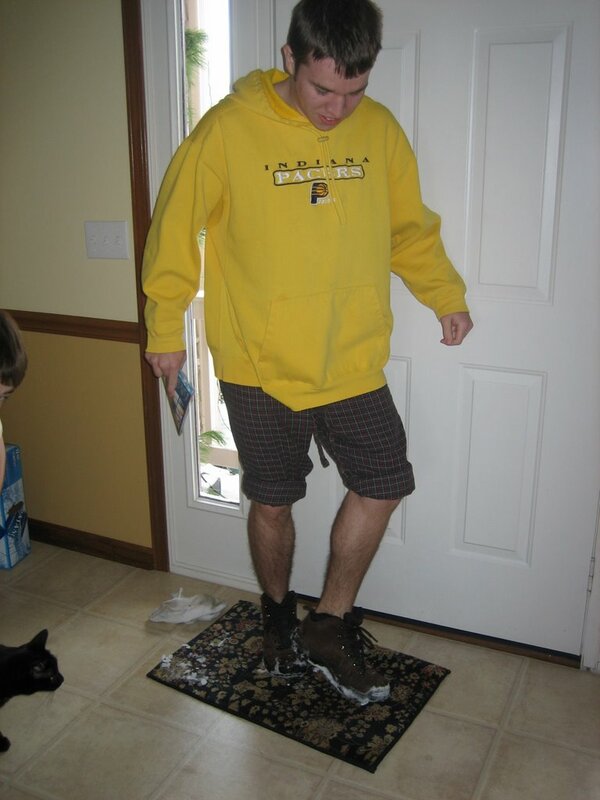 The second is Patrick dressed for running to the mailbox in the snow last week. If you like making gifts for Christmas and are still looking for some ideas Scribbit has some great ones on her blog. 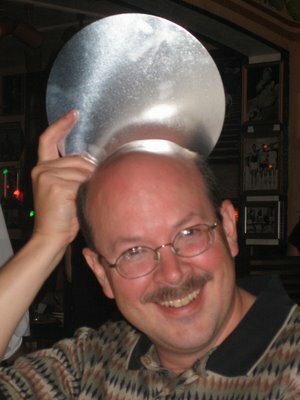 I have a regular round of blogs that I try to catch at least every day. I have a new addition this week in the (mostly) theology category: House, M.Div. I prescribe that you go read it. It will be good for you. As is so often the case nothing around here went according to plan yesterday, so I am now behind on my cookie making. Today promises to be a busy enough day without haveing stuff from yesterday added, but I have to squeeze in some cookie time today. I have a warning for all of you: Don't go to Target at 5:30 at night! There are seriously stressed out people there at that time of night driving dangerously out-of-control carts and dragging seriously exhausted and hugry children. I managed to get out with a few gifts and with only a small bruise on my ankle from a runaway cart. We had the second of our dinners from On My Thyme yesterday since I ended up being out all day and Colin and I had a dance lesson last night. It was pork chops baked with sweet potatoes, apples, onions, and raisins in a soy-based sauce. It was absolutely delicious! This is definitely going to become a regular part of the (lack of) routine around here. Today my mom is coming for a visit. I had hoped to be able to relax and enjoy it, but I don't think I'll be able to stop working on things. At least the meat for the dinner at church tonight is in the crockpot. I hope I got it in on time. I couldn't sleep last night so I woke up late this morning. If you homeschool and you're in Fort Wayne, check out Pastor Petersen's blog. 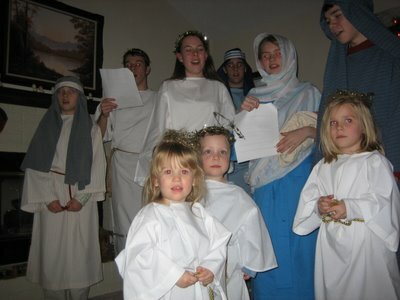 Greek will be offered to homeschoolers after the first of the year at Redeemer. One of my favorite Christmas traditions is baking cookies. Right now I have about 25 dozen in the freezer and this afternoon I am planning to get another 15 dozen or so baked. So far we have Ginger Crinkles, Snickerdoodles sprinkled with red sugar, Spritz, and some yummy cookies simply called Christmas Cookies that have cornflakes, rolled oats, and pecans. I also have the dough made up for my cut out sugar cookies. We'll make those this afternoon along with our Mexican Wedding Cakes and my White Christmas Crinkles. Friday is for the cookies made with dates. Colin and I went out to dinner and dancing Friday night and the kids ate the first of our dinners from On My Thyme. They ate the beef wet burritos and it not only fed all four of them, but it also provided Patrick with his late night snack, a.k.a. second supper, and Bethany and I with lunch the next day. We all found them to be delicious. This is a fantastic deal. You would pay more than this for just one open dance. We have been dancing for almost exactly a year now, taking about two private lessons a month, and I can't believe how much we have learned! 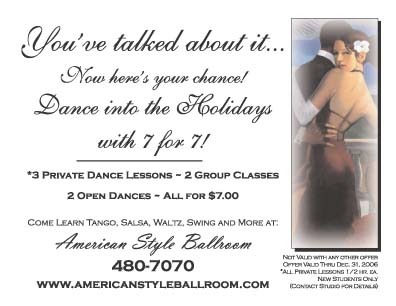 We can dance waltz, foxtrot, swing, rumba, tango, salsa, hustle, & cha-cha well enough to get through a song and enjoy it. We are still learning how to do each of these better--more style, more steps, etc.--as well as working on a few other dances. It is great exercise and a wonderful way to spend time with your spouse! The theme for this week is red. 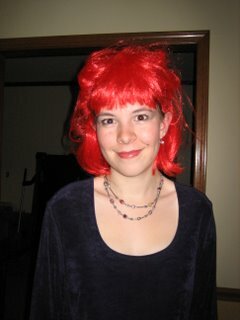 I love this picture of my daughter wearing a bright red wig for Halloween a couple of years ago. December just started and already it's the 7th. How does that happen? We had a blast at On My Thyme. Julie tells a bit about it on her blog. I can't wait to try the food that we made. Everything looked and smelled delicious. I'm already looking forward to going next month! As I sit here the snow is gorgeous coming down outside my office window. Earlier today it was snowing here, but, as I drove across town it was completely clear. That snow never did move east. I wonder if this is getting the rest of town. The soup for the advent supper is bubbling on the stove and the brownies just came out of the oven. We always look so forward to these pre-Advent service suppers! Tomorrow night I'm trying something new in the perpetual battle to get dinner on the table. I am going with three friends to On My Thyme, where we will each prepare six entrees of about six servings each to take home. I know we'll have a good time; I just hope my family likes the food. They aren't picky eaters, but I am a good cook and they are accustomed to my cooking. My husband was concerned about what meals these would be replacing and I assured him that these entrees would be for the nights that are currently covered by frozen pizzas or quick stops by the sub shop. These will be called into service on those nights that I just don't have time to cook. I'm looking forward to this. Friends, wine, food, & conversation. I'll let you know what we think. I have a hard time resisting a quiz. Especially if it involves books. Today's theme was light(s). 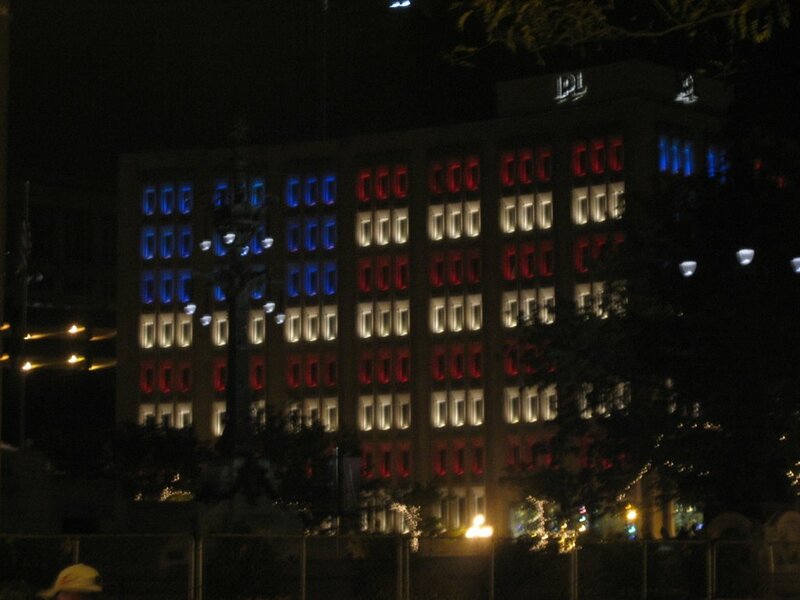 I had a little bit of trouble because I knew I had some pictures but I couldn't find them. Then I figured out that they just never made it onto my computer. 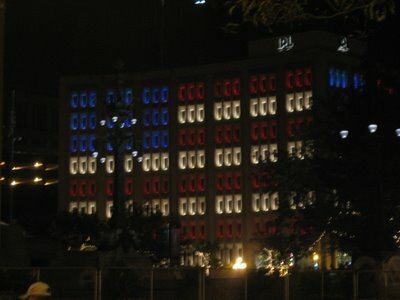 The first is a picture of the IPL building in downtown Indianapolis. I'm guessing that at this time of year the lights have changed to a Christmas theme. The second piture is my husband, who carries his own personal light source with him. 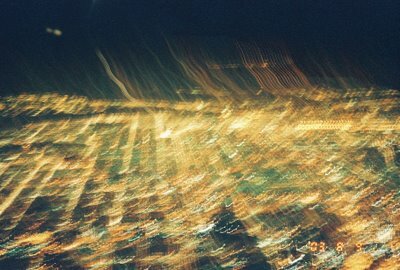 The third is the lights of LA from a plane. I have flown into lots of big cities at night, but LA seemed to go on forever! I've known a number of women over the years who hit my age, plus or minus five years, and decided to dramatically change their lives. This usually involves jettisoning a husband. One acquaintance even left the kids behind, and ran away to find herself. For some the action isn't as destructive and involves starting a new career or heading back to school. I've been going through a bit of this reevaluating for the last couple of years. It put me into a funk, finding myself to be a failure by the standards that I had been raised with. I was raised to be a career woman, told repeatedly from the time I was small that I could do anything that I wanted. As a teen I was pushed toward high-earning career options. I earned scholarships and awards. I was on my way. But instead of going the high-powered career route I married at 21, started having children immediately and spent ten years trying to juggle college and a desire for a career with the realities of motherhood. When I was 31 we began homeschooling, more as a matter of necessity than choice and I was committed to being something I had never dreamed of being: a stay-at-home-mom. Over the years I've been in and out of home businesses. I've dabbled with my writing. I've done tons of volunteer work. But I've always had in the back of my mind that this is all temporary, until I start doing what I'm really going to do. I started realizing a couple of years ago that this is my life. There's something about losing a parent and having a child reach young adulthood--not to mention not being able to do cartwheels anymore--that brings home the truth about life progressing. So I've spent the last couple of years accomplishing very little. I've let my business languish. My house is a wreck. I've written nothing of substance. I've lost touch with old friends. Oh, I've been busy enough. Volunteering is a good way to get out of doing what you need to do at home. No one can criticize you for having a messy house when you are involved in all kinds of stuff. I finally decided about two months ago that I needed to seriously look at things and figure out what direction my life was taking and was going to take. Don't worry. The husband and kids weren't on the chopping block. Homeschooling was, but only for a brief time. I took a hint from the way my husband does things and I made a spreadsheet of positives and negatives of all kinds of different things. I looked at the impact lots of things have on our family and our life and figured out what was staying and going. Homeschooling is almost all positive. It stays. My business is all positive except for the stress I feel when I don't work. It stays. For the last couple of months I've been doing less shopping, less dreaming, more cooking, more cleaning, more reading and writing. 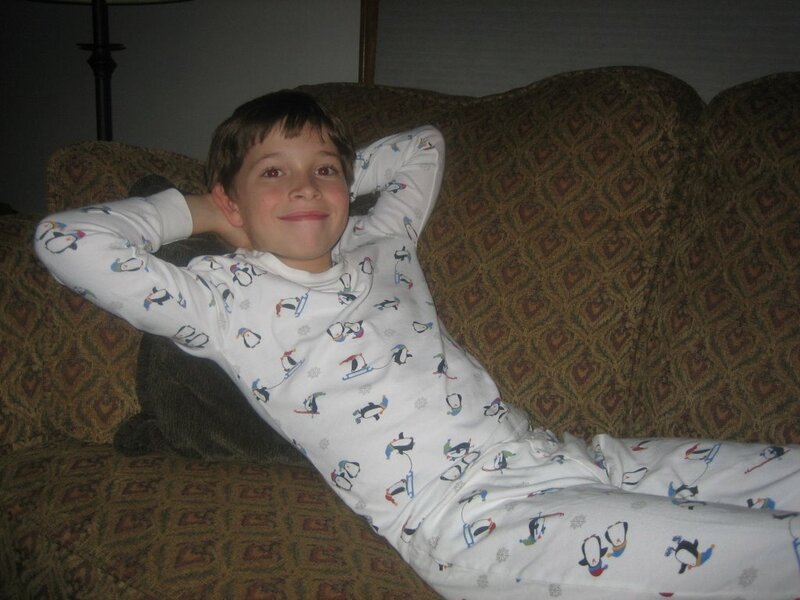 I've always spent lots of time with my kids. That stays. Going out to lunch with friends once in a while stays. The main thing that has changed is my attitude. I am actually starting to enjoy the more mundane parts of my life. I'm even going to sit down before the first of the year and get my checkbook balanced. Maybe I've finally grown up.